Ural NEXT LNG 6x6 powered by environmentally friendly gas fuel successfully completed participation in the Gas Into Motors international NGV rally, organized by Gazprom, CNPC and KazMunayGas (KMG). Ural NEXT finished in St. Petersburg at the 8th St. Petersburg International Gas Forum having traveled over 10 000 km on the roads of China, Kazakhstan and Russia. After the rally vehicle will be sent to one of the Gazprom’s subsidiaries – Gazprom Transgaz Tchaikovsky (the city of Tchaikovsky, Perm region). Ural NEXT LNG will be used to deliver working crews and equipment to the sites for servicing the company's gas pipelines. Days-long Gas into Motors NGV rally started on September 4 in Rudong, China and passed through the cities and towns of the People's Republic of China, the Republic of Kazakhstan and Russia. The distance covered by 15 NGV’s was about 10 000 km. As part of the project, the liquefied natural gas-powered Ural NEXT took part in various events, such as Xian’s Forum on promotion of natural gas use as a motor fuel, opening and commissioning of the Cryogenic filling station of KunLun Energy Company Limited in Wuwei (PRC) and others. Ural NEXT LNG coped with all types of roads and aroused great interest among the participants of the events. The use of NGVs provides high fuel efficiency. During the rally, the crew of Ural NEXT LNG saved around 1600 Euros due to the use of natural gas as a fuel. They calculated that the vehicle had consumed 26 kilos of LNG per 100 km in average on 10 500 km route from China's Rudong to St. Petersburg. Also, the use of liquefied natural gas as a motor fuel can significantly reduce the burden on the environment. For instance, emissions of exhaust gases, such as nitrogen oxides and hydrocarbons, are reduced by 66% and 89%, respectively, compared to emissions of diesel cars. 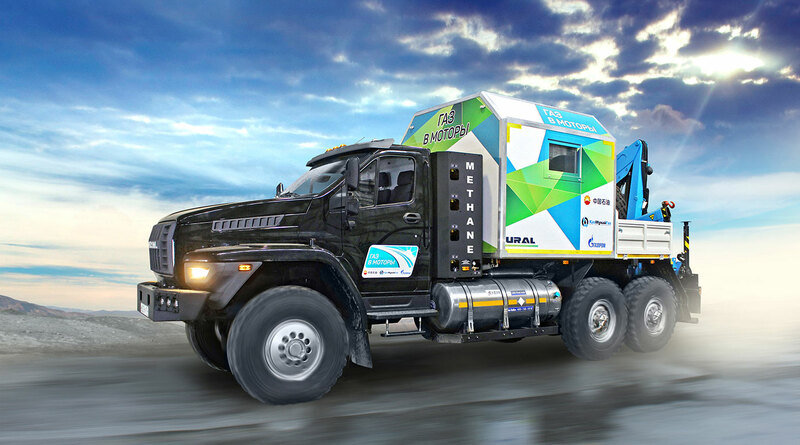 The Ural NEXT LNG truck, which took part in the rally, used a combined fuel system with the LNG storage and regasification system as the main one and the CNG supply system as the supplement. This solution makes it possible to refuel the vehicle at a bi-fuel station. The total fuel distance of a truck with such a fuel system is about 1000 km, which is one of the best indicators for all-wheel drive trucks. Ural NEXT LNG’s cryogenic tank is equipped with a universal filling neck that fits the JC Carter and Macrotech nozzles fully compliant with European standards. Ural NEXT off-road vehicle is equipped with YAMZ-536 six-cylinder in-line gas engine. The vehicle contains nine gas cylinders with the total volume of 892 liters for compressed natural gas and an in-frame cryogenic storage tank with the total volume of 450 liters for liquefied gas placed behind the cab. Liquefied natural gas cooled down to the temperature of minus 162 °C is stored in the cryogenic tank and prior to being supplied into the engine it is converted from a liquid state into gaseous. The volume of regasified fuel is approximately 240 cubic meters.